Project Details...thickness, artwork, instructions, quantity, etc. Magnets for Marketing offers a wide variety of house-shaped magnets for real estate professionals as well as anyone who offers services for the home, including mortgage companies, pest control, cleaning services, insurance agents, heating/cooling services, landscaping, home health care and many more industries. Print your logo, contact information, specials, business hours, or coupons.......any information that you want to stick around. We can print your artwork or design something fresh and creative just for your project. 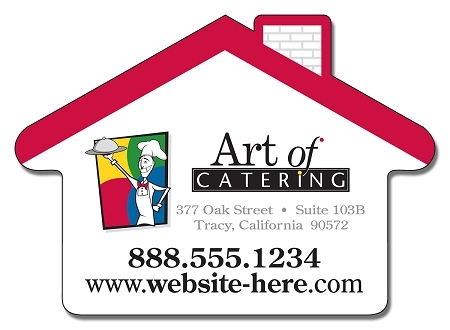 Our house-shaped magnets are printed in striking full-color and are available in a variety of sizes and thicknesses. There is a magnet suited for every budget and project. 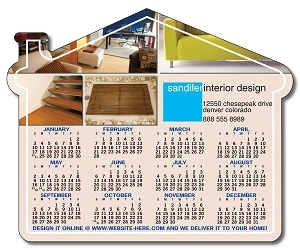 House Shape Picture Frame Magnet - 4.3" x 6"
House Shape Magnet - 4.75" x 3.875"
House Shape Magnet - 4.5" x 3.85"
House Shape Magnet - 4" x 3.5"
House Shape Calendar Magnet - 3.75" x 6.125"
Copyright Magnets For Marketing. All Rights Reserved.